“One of the most amazing [bodily] preservations is that of Saint Andrew Bobola [1590 to 1657]. Prior to his martyrdom he was partially flayed alive, his hands were hacked off and his tongue was torn from his head. Splinters of wood were riven under his fingernails, and his face sustained such mutilations that he was scarcely recognizable. After hours of further tortures and mutilations, he was dispatched by a sword’s blow to the neck. His body was hastily buried by Catholics in a vault beneath the Jesuit church at Pinsk [Poland], where it was found forty years later perfectly preserved, in spite of the open wounds, which would normally foster corruption. Although his grave had been damp, causing his vestments to rot, and in spite of the proximity of decaying corpses, his body was perfectly flexible, his flesh and muscle soft to the touch, and the blood which covered the numerous wounds was found to be like that which is freshly congealed. The preservation was officially recognized by the Congregation of Rites in 1835. Even though the [body] was roughly handled during its numerous translations, the body remains after 300 years in a marvelous state of preservation” (The Incorruptibles by Joan Carroll Cruz,p. 36). “The bodies of holy martyrs and others now living with Christ, bodies which were His members and temples of the Holy Spirit, which one day are to be raised up by Him and made glorious in everlasting life, are to be venerated by the faithful; God gives men many benefits through them” (Council of Trent). References: The Incorruptibles by Joan Carroll Cruz (TAN Books); and Origin of the Human Species by Dennis Bonnette (Sapientia Press). 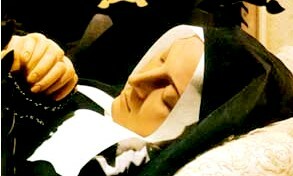 The photograph above is of the incorrupt body of Saint Bernadette (to whom the Virgin Mary appeared at Lourdes).